Professor Michael Beer, University of Liverpool Wednesday 22nd February 2012, 1200-1300 Lancaster University, Lancaster Environment Centre, Training Read more.. Uncertainty and imprecision in structural parameters and in environmental conditions and loads are challenging phenomena in engineering analyses. They require an appropriate mathematical modelling and quantification to obtain realistic results when predicting the behaviour and reliability of engineering structures and systems. But the modelling and quantification are complicated by the characteristics of the available information, which involves, for example, sparse data, poor measurements and subjective information. This raises the question whether the available information is sufficient for a probabilistic modelling or rather suggests a set-theoretical modelling. The framework of imprecise probabilities provides a mathematical basis to deal with these problems which involve both probabilistic and non-probabilistic characteristics of information. A common feature of the various concepts of imprecise probabilities is the consideration of an entire set of probabilistic models in one analysis. But there are differences between the concepts in the mathematical description of this set and in the theoretical connection to the probabilistic models involved. This seminar provides an overview on selected concepts of imprecise probabilities, which are increasingly adopted for the solution of engineering problems. Specific features and relationships between the models are discussed. Particular attention is devoted to the concept of fuzzy probabilities. Examples of applications in engineering underline the usefulness of the concepts discussed. Michael Beer is Professor of Uncertainty in Engineering in the Centre for Engineering Sustainability, School of Engineering, University of Liverpool. He graduated with a doctoral degree in Civil Engineering from the Technische Universität Dresden, Germany. As a Feodor-Lynen Fellow of the Alexander von Humboldt-Foundation Professor Beer pursued research at Rice University together with Professor Pol D. Spanos. From 2007 to 2011 he worked as an Assistant Professor in the Department of Civil & Environmental Engineering, National University of Singapore. His research is focused on non-traditional uncertainty models in engineering with emphasis on reliability analysis and on robust design. Professor Beer is a Member of ASME, Charter Member of the ASCE Engineering Mechanics Institute, Member of the European Association for Structural Dynamics, Member of IACM, as well as Member of the Editorial Board of Probabilistic Engineering Mechanics and Computers & Structures. It was great to be able to talk about soil and water issues on BBC 1's Countryfile last week. I believe this is exactly the sort of thing we need to be Read more.. It was great to be able to talk about soil and water issues on BBC 1’s Countryfile last week. I believe this is exactly the sort of thing we need to be doing to raise awareness about soil and water to a national audience. 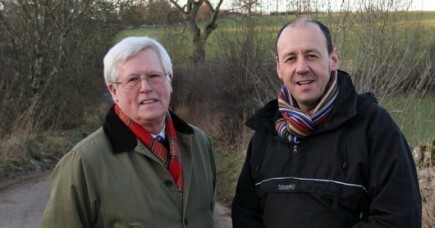 John Craven and Phil Haygarth chat in the Eden catchment at Newby End Farm. The feature, about organic farming and water quality across Britain, was aired on BBC1 on February 5th 2012. J. W. Hall, G. Watts, M. Keil, L. de Vial, R. Street, K. Conlan, P. E. O’Connell, K. J. Beven & C. G. Kilsby (2012) Towards risk-based water resources Read more.. The James Hutton Institute and University of Stirling have teamed up to deliver a capacity-building project focused on diffuse pollution management in Read more..
Held at West Park Centre, University of Dundee, 9-11 July 2012. Full programme of technical sessions, social programme and field visits. More info at Read more..
Held at West Park Centre, University of Dundee, 9-11 July 2012. Full programme of technical sessions, social programme and field visits.